Totaling 29 acres and multiple parks and recreational opportunities, Desert Mountain Park in Queen Creek, Arizona is a great place for residents and visitors to hang out and enjoy the beautiful Arizona weather. Whether you’re looking to picnic or play, this city park offers many options for your recreational needs. Amenities include plentiful parking, two lighted basketball courts, two sand volleyball courts, four lighted Little League fields, two lighted multi-purpose fields, two playgrounds, one interpretative playground, eight picnic ramadas, an amphitheater to accommodate 150-200 people with picnic ramada seating, access to wash trail, ADA access, equestrian staging area and a demonstration garden. Reservations for park space can be made through Town of Queen Creek Parks and Recreation Department, 480-358-3700. The city maintains the park and has been cited as “always clean” and “well kept.” With its location close to the school, established neighborhoods such as; Montelena and Terraranch, and up-and-coming subdivision of; Victoria make this park convenient for frequent visitation. Extensive bike and wash trails stemming all the way through Queen Creek to Gilbert make this park a popular destination for neighboring resident bike riders, pedestrians, and horseback riders. 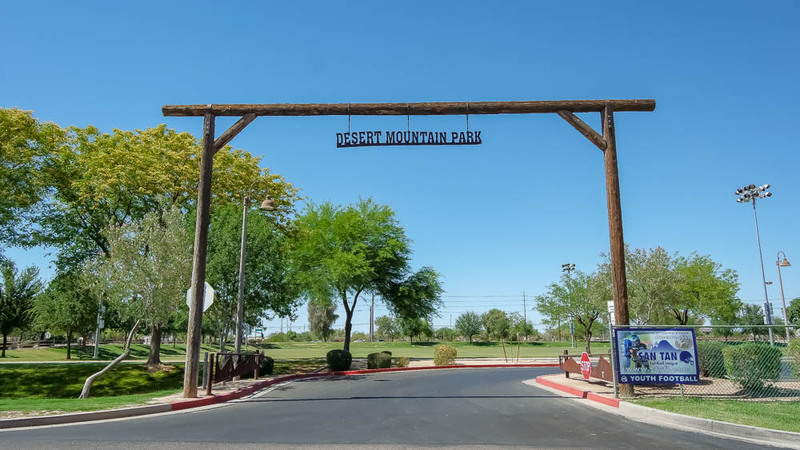 If you get the chance and are in the mood to hang out at a local park, check out Desert Mountain Park, you won't be sorry.